Q. How can I make flashcards with Microsoft Word's templates? Note: some people are reporting that they can no longer find the flashcard template we are recommending. If this is you, we've created two re-useable documents you can simply download and save as your own for flashcard creation. One has five flashcards per page (business card size) and one has one flashcard per page. See the bottom of this answer for those templates. To make a set of flashcards in Microsoft 13's Word, select New and then type in flash card in the search box. You will see a variety of flashcard templates to choose from (vocabularly, addition, multiplication). 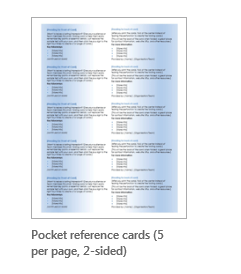 To make more advanced/home made flashcards, search for "Pocket Reference" cards. To make a flashcard in Microsoft 7's Word, you should click on "file" then "new" and then you will see a selection of templates to choose from. Use the search bar at the right/center to type in flashcards, and you will get a selection of flash cards to choose from (see images below). Once you have a selection of Flashcard templates to choose from, simply pick one and fill them in as you like!